Nikephoros I was Byzantine Emperor from 802 to 811, when he was killed in the Battle of Pliska. He is sometimes called "the Logothete" due to his previous position as Minister of Finance (Genikos Logothetes). 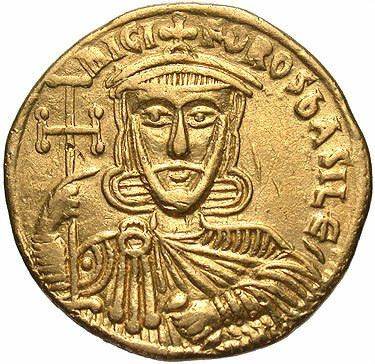 Nikephoros embarked on a general reorganization of the Roman Empire, creating new themes in the Balkans and strengthening the frontiers. Needing large sums to increase his military forces, he set himself with great energy to increase the Empire's revenue - this made him very unpopular with the clergy. In 811 Nikephoros invaded Bulgaria and sacked the Bulgarian capital Pliska. The Chronicle Michael the Syrian, describes the brutalities and atrocities of Nikephoros: "Nikephoros, emperor of the Byzantine empire, walked into the Bulgarians' land: he was victorious and killed great number of them. He reached their capital, seized it and devastated it. His savagery went to the point that he ordered to bring their small children, got them tied down on earth and made thresh grain stones to smash them." During his retreat, the imperial army was ambushed and destroyed. Nikephoros was captured and sent to Pliska, where Krum ordered his decapitation. Krum is said to have made a drinking-cup of Nikephoros' skull.